The United States Environmental Protection Agency has previously refused to regulate carbon dioxide and other greenhouse-gas emissions from automobiles. Twelve states and thirteen environmental groups sued the EPA, arguing that it had the authority (and responsibility) to regulate these. Do states have the right to sue the EPA, challenging its position? Yes. Does the EPA have the authority under the Clean Air Act to regulate these emissions? Yes. Can the EPA choose not to regulate them? Perhaps, but it must reconsider. Basically, the ruling states that the reasons the EPA has used to abdicate its responsibilities are varied and irrelevant [my language]; the EPA must reconsider its decision and provide reasons related to the Clean Air Act. The ruling does not go as far as ordering the EPA to act—that’ll be the next battle! President Bush has admitted that global warming exists, but has resisted taking concrete action. With this ruling (and another one today, involving emissions from older coal plants), the judicial branch and the legislative branch of the U.S. government are becoming increasingly proactive about working to make change. If he does not begin to take some responsibility soon, he will be left standing alone. Please see CNN and New Scientist for more information. 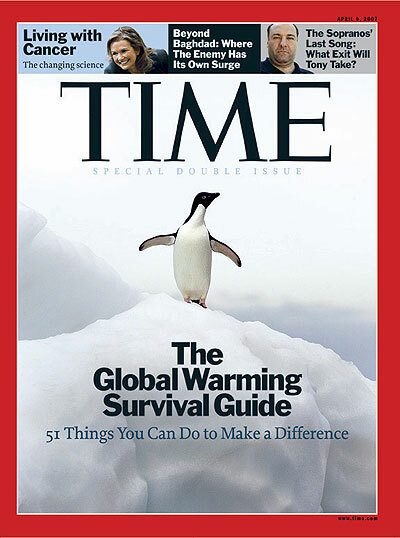 This week’s issue of Time (9 April 2007) is a special issue dedicated to global warming. It takes a multifaceted look at anthropogenic climate change, with a focus on what governments, corporations, and individuals can do (and are doing) to combat this global threat. It was probably always too much to believe that human beings would be responsible stewards of the planet. We may be the smartest of all the animals, endowed with exponentially greater powers of insight and abstraction, but we’re animals all the same. That means that we can also be shortsighted and brutish, hungry for food, resources, land—and heedless of the mess we leave behind trying to get them. I’ve also been enjoying reading their fifty-one–item “Global Warming Survival Guide,” with ideas about what we and others can do or push for in order to proceed down the path to recovery. Both of these articles, as well as others on global warming and other topics, are available at Time’s web site, free of charge and without any registration required. I’d actually encourage you, though, to purchase this issue if you can, for several reasons: One, to support Time for giving this issue the attention and treatment it deserves. Two, it’s a lot of reading material and is probably best read in print form, especially due to portability. Three, if you read it in public, it could encourage others to take interest (that’s happened to me once already, actually). Google’s commitment to “green” means that the company sources carpet and sofas made without PVC, paints without volatile organic compounds, and cafeteria food from local growers. It’s not surprising, then, that they would roll out the largest commercial solar deployment in the US—a 1.6MW installation that covers most of the buildings at Google’s campus and extends even to shaded parking spaces. Apparently, this could meet an impressive 30% of Google’s peak power needs. Very impressive indeed. Speaking of Google, I came across something cool yesterday. Try this: Go to Google Maps. Ask it to calculate directions from Chicago to London (or you can use this direct link). Step 20 is my favorite.